A vibrant group of amateur adult musicians of all ages, rehearses every other week for a total of nine meetings per semester. Orchestra repertoire is varied, but primarily consists of symphonic literature of the classical period. Emphasis is placed on sight reading new music on a regular basis and reading specific works of particular interest to orchestra members. Member recommendations of additional works to be read during the season are also welcome. 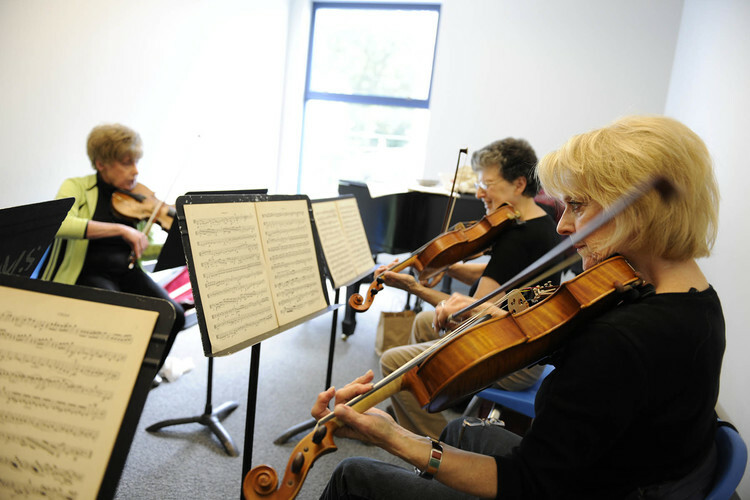 The Adult Orchestra meets every other Tuesday from 10 a.m. to 12:30 p.m. at the Willow Grove Branch. Schedule and registration form for the 2018-19 season are available here. The Orchestra is led by conductor Martin Knoblauch. In the last 50 years, Martin has conducted over 500 works of orchestra, opera and choral repertoire throughout the Philadelphia area. His musical interests extend from Gregorian Chant to Wagner. He has Bachelors and Masters degrees in Orchestral and Opera Conducting from the University of the Arts. For more information or to register, contact Program Coordinator Mary Felley via email or call 215-320-2698.